The view from the top is usually a beautiful sight. Far above the noise of the crowd below, you get a clearer perspective of the details below. Unless you're crew chief for Kyle Busch, and he's in a battle with Brad Keselowski. In that case, you'd probably describe your view just like Adam Stevens did. "A little bit nerve-racking," was Stevens's response when asked about his view when the No. 18 and the No. 2 were battling for the lead Saturday night in Richmond. Stevens talked more about the Busch/Keselowski campaign for the top spot in the second race of the playoffs. "You know, they're not going to give each other too much room. You'd expect maybe a little bit more room between two other guys, so it makes you nervous, but they raced each other with respect. That whole deal is probably a little bit blown out of proportion compared to what it's really like on the racetrack. They were probably a little bit better on the short run and we were certainly better on the long run, so it was a matter of time before we got around them. But you never know when the caution is going to come out, either, so he was pressing as hard as he could to keep us behind him, and Kyle was pressing as hard as he could to get around him, so if we did get a caution, we could at least lead them down pit road. 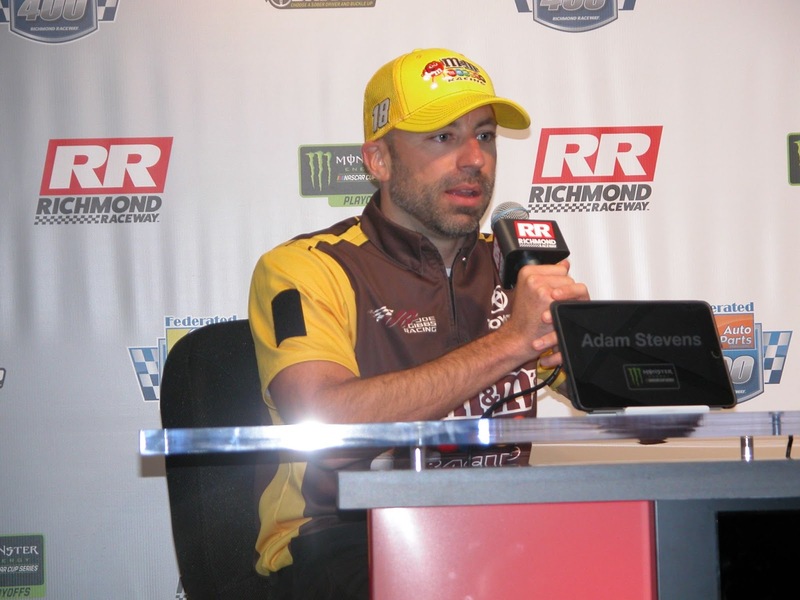 But I was more worried that we were going to get to racing each other and then the 4 was going to put us three wide and pass us both is what my main concern was," Stevens said. Stevens was asked about the lack of typical short track beating and banging since the Richmond race only saw three cautions during the entire race and just one of those was for an on-track incident. Are drivers saving up for next week's "roval" action at Charlotte Motor Speedway? "I think what you see is the skill of the drivers and the teams and the ability to run more than one lane here. You can run, gosh, at least three or four different lines, and if you have a little bit of speed, you can get around somebody. You can go in the corner two wide and come out two wide. You know, it takes a mistake to really get into somebody. "When you get into later laps, you see guys lean on each other a little more. You don't really see that in the middle of a race in general. But this place is just so racy, and the tires fall off, and it rewards taking care of your tires, and it's a lot of fun for the drivers and fun for the teams. "I think even without the beating and banging, you see really good racing on the racetrack, for the lead or even all through the field. "As far as the Roval, you know, guys were probably trying to really maximize their days today because there's going to be a lot of people leave there disappointed next week. You know, it could be people that have a good car and wheel hop it one time or hit a curb one time too hard. It's going to be hard to find a place to pass. It was hard on tires at the test. The reasons to go down there and have a bad day, it's pretty long. But we haven't raced there yesterday, so we don't really know what we're up against. It's going to be fun to be a part of and fun to watch and fun to not really matter where we have to finish," Stevens explained. Winning at Richmond gives Busch an automatic trip to the next round, so he'll probably relax and just make laps in Charlotte next weekend, right? Not so fast. "... we just don't have any expectation other than to go down there and win, and that frees you up, probably make some more aggressive moves, and we're going to need that track to keep Kyle to have one at every single track that we go to because this is a new one for us. "We want to go there, and we want to try to win. The whole goal was to get locked out this weekend and we did that. Felt like we could have done that just by scoring some decent points, but we did it with a win. We're going to go there and try our best to get another trophy," Stevens said. Given the wins he's racked up this season, that's perfectly within expectations.